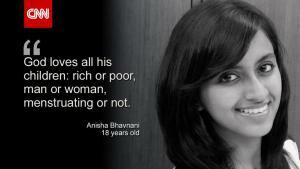 Bravo to this young woman, Anisha Bhavnani, and her Amma. All of us need to stand against untouchability in its many forms. Let us see that our daughters can also answer “no” to the question Anisha faced. Read on …. Hasn’t your mother told you that you can’t step inside a temple when you have your period?